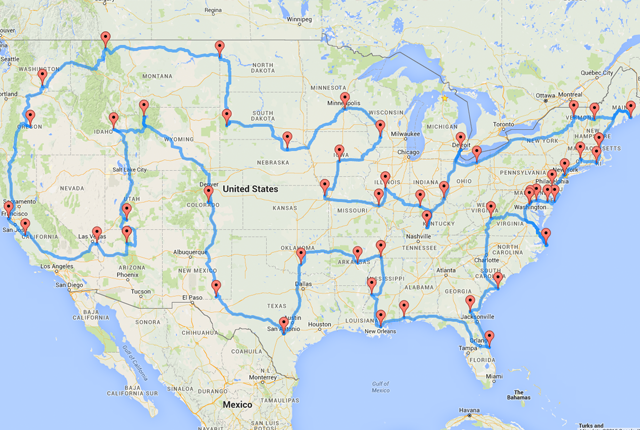 This map shows an optimum road trip in the U.S and while at first glance it looks a little bit weird and hard to get, don’t scratch your head just yet. Obviously a ” perfect ” road trip is very depending on your personal preference and how long you want to spend your time driving. But this is a really good route to chose. Discovery News staffer Tracy Staedter decided to bite this test and see what she gets, with the Michigan State University doctoral student, Randy Olson and the man behind the Where’s Waldo algorithm they started to form this ultimate U.S road trip. The rules of the challenge will be: It had to touch all of the 48 continental states, and every stop along the way must be on National Natural Landmark, a National Historic Site, a National Park, or a National Monument, and of course, the entire route had to be confined to car travel and within U.S. borders. The list begins with the Grand Canyon, but you can technically start anywhere as long as you stay in sequence after that starting point. Staedter assumes that it would take around nine days to drive it through, but in a more rational view, it will take a two to three months to complete this trip. Check out Olson’s blog for more in-depth info on how he created the algorithm for this route. But after determining the stops,the main goal of the algorithm was to discover the shortest distance between points. The route has one stop in Washington D.C and two stops in California, the result is a 50 stops road trip that takes you through the heart of American culture. See the full interactive map here and for the love of god, just hit the road!